Show note creators and latest editors: This option will display the details of users who have created and edited notes to all users. This includes notes which are in the Closed Notes page. Round corners: This option is switched on by default. If you would prefer your StickyNotes to have square edges, untick this option. Show tooltips: The Host has the option of turning both the hover over/pop up and bottom bar tooltips off if the wish. 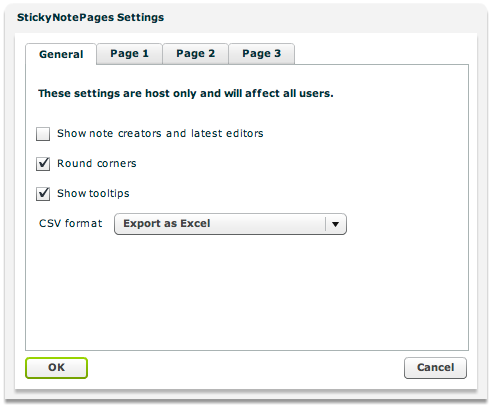 CSV Format: Hosts can decide what format any export of notes will be provided in. Currently the choices are in Excel or Unix formats. 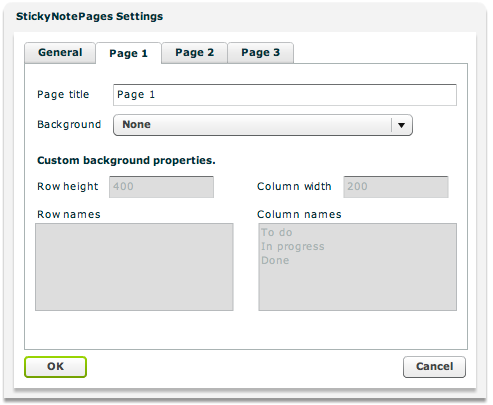 Users who choose to download the notes from StickyNotePages will receive the file in the chosen format. Page Title: The Host has the option of setting more meaningful titles for the three pages of notes available in StickyNotePages. These can be changed at any time. Custom background properties: You can add rows and columns to your custom background simply by giving them names in the Row/Column names box one per line. Set the width of columns and rows by adding the widths in pixels to the appropriate boxes.